Amsterdam has a unique cycling culture. You want to explore Amsterdam? Amsterdam is the perfect city to explore by bike. Cycling is fast, sustainable and fun. We offer the newest top brand bikes and a wide variety. 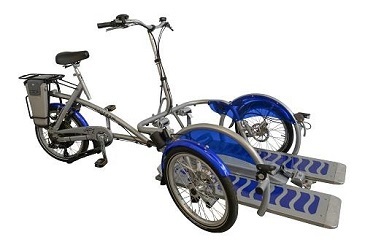 Including wheelchairs,bikes for disabled, tandems for couples and fun2Go bikes. But also we offer the traditional Dutch 'granny bike', made by Sparta™ since 1917. 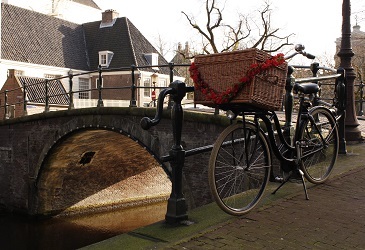 You will fit in with the locals as you cruise the miles of dedicated bicycle paths within Amsterdam, or head out into the countryside with our picnic baskets.Ask for our luggagestorage service. We are located behind Amsterdam C.S and open daily. Our experienced staff will be happy to show you our wide variety of bikes and e.
Our specialized picnic bike. Rugged aluminium frame with generator lighting, mud guards and an extra large front rack with elasticized straps for our picnic basket. Our specialized wheelchair carrier.Electric supported. (Translated by Google) Good and cheap, also it is located within walking distance of the main station. Everything was straightforward and the wheels were of good quality. With the bicycles there is a wide selection and one can be on request also rented bike insured. Good advice, pleasant atmosphere. Gut und günstig, zudem ist es fußläufig vom Hbf gelegen. Alles war unkompliziert und die Räder waren von guter Qualität. Bei den Fahrrädern gibt es eine breite Auswahl und man kann sich auf Wunsch sein ausgeliehenes Fahrrad auch versichern lassen. Gute Beratung, angenehme Atmosphäre. 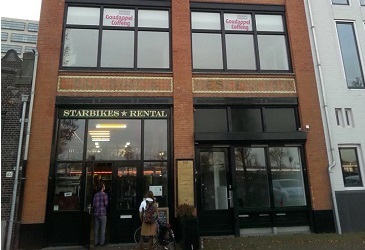 Probably the best bike rental service in the area of the central of amsterdam, right next to the central train station. We new to go there from online recommendations of the best price and good quality. The bikes are great, standart black granny bikes with one speed. They come with 2 locks, a built in one and a chain lock. We took 2 bikes for 2 days and had great recommendations from the staf for places to go and see with the bike. I would definitely recommand the service to friends and family coming to amsterdam. This is the place you want to rent a bike. You will get a personal touch with every rental, the service will pick a bike for personally and will make sure in front of you that everything works perfectly. The place itself is very cool, location also very nice and close to the main station. Much better than those big rental places, I can only recommend!